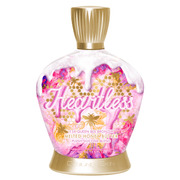 15X Queen Bee Bronzing power for a tantalizing glow. Melted Honey Butter Base provides a blend of Beeswax, Honey and Gold of Pleasure Oil. Plush Silicone Blend helps to blur fine lines and wrinkles.